If you have a backyard pool in Greenville, SC , there are certain precautions you must take to ensure that your swimming pool is used safely by family and guests. Swimming pool accidents can be tragic, and it’s important to make everyone who uses your pool aware of crucial water safety tips. Watch this video to learn more about swimming pool safety, and put these practices into effect around your backyard pool immediately. Everyone can relax and enjoy your swimming pool free from accident and injury if you adhere to these pool safety guidelines. What Are the Different Types of In Ground Pools? If you’re considering a custom in-ground pool in Greenville, SC , you may be wondering what your options are. In-ground swimming pools allow you the convenience and luxury of your own personal outdoor living space. You can maintain your physical and emotional health through regular exercise in your swimming pool, without even leaving your home. Nowadays, there are so many custom pool designs available that it’s easy to find one that fits your lifestyle and needs. Here are just a few of your custom in-ground pool choices. A beautiful, natural rocks-and-waterfalls pool design can make your custom pool a relaxing tropical oasis. A pool builder with your swimming pool company will work out a pool design with you that will show you exactly where each rock and waterfall will be placed. This will ensure that you have the backyard pool of your dreams. An experienced swimming pool contractor will use a company to manufacture gorgeous artificial rocks to use in your swimming pool construction. You will be able to choose the size, shape, color, and detail of each artificial rock. 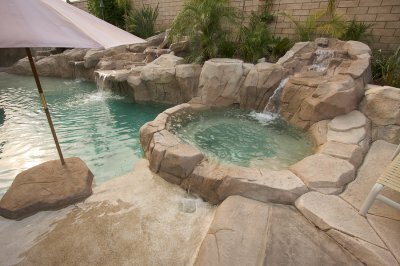 You can also choose the size and placement of the waterfalls in your custom swimming pool. 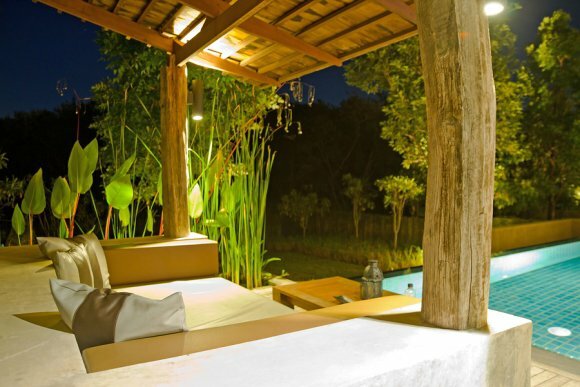 A popular trend in custom pools and outdoor living spaces is the use of fire features. Fires add warmth and ambience to a backyard pool and outdoor living space, creating an inviting, comforting environment for a party or gathering. An experienced pool builder or pool designer can integrate fire features into your custom pool design, as close to the pool as you want it. Many people like using fire features year round in their swimming pools, as they add such an elegant aesthetic. Your swimming pool company may be able to offer you specialty plaster for use in your custom swimming pool. Specialty plaster almost eliminates algae and stains in backyard pools. Ask your pool designers or pool builder if they offer plaster alternatives or specialty plaster for their in-ground pool installations.